Designing dinosaur and prehistoric animal models is a tricky business. With the advent of three-dimensional printing technology and modelling software, things have got a little easier but there is still all the work involved in creating prototypes, mould building and so on. Today, we feature the Kaiyodo Sofubi Toy Box T. rex figure, a dinosaur model that was developed to demonstrate how scientific thinking regarding the stance of Theropod dinosaurs such as Tyrannosaurus rex has changed over the last hundred years or so. The Japanese model maker Kaiyodo has employed state-of-the-art modelling techniques to produce fantastic, highly collectable dinosaur models and figures. The design team excelled themselves when developing a collectable figure with ten points of articulation. Many models have an articulated lower jaw, but for the design team at Kaiyodo, doing the ordinary was out of the question, in their limited edition T. rex Toy Box figures, they opted for an articulated upper jaw instead. There has been a trend in recent years for dinosaur models to have articulated jaws and front limbs. One of the benefits of an articulated jaw for example, is this feature does permit collectors to be able to close the mouth of their figure. Many Theropod dinosaur models tend to depict these animals with their mouth open, not a natural pose at all. Most tetrapods don’t walk round all day with the jaws wide open. It is the lower jaw that is articulated in the vast majority of these figures. However, in order to demonstrate their engineering credentials, the design team at Kaiyodo gave their Sofubi Toy Box T. rex an articulated upper jaw (premaxilla and maxilla), as demonstrated in this short forty-five second video. Kaiyodo Sofubi Toy Box T. rex in a “kangaroo” pose. When first scientifically described, Tyrannosaurus rex was illustrated as a biped whose tail dragged on the ground. The articulated tail of the Sofubi Toy Box T. rex permits the model to displayed in this position, a pose described as a “kangaroo pose” or sometimes a “kangaroo stance”. However, the ingenious engineering allows this figure to be displayed in what is thought to be a more anatomically accurate pose, with the centre of balance over the hips and the tail lifted off the ground – a sort of pose described as a “balanced see-saw”. The Kaiyodo Sofubi Toy Box articulated T. rex figure with the tail lifted off the ground. Kaiyodo Sofubi Toy Box T. rex dinosaur figure (T. rex A). 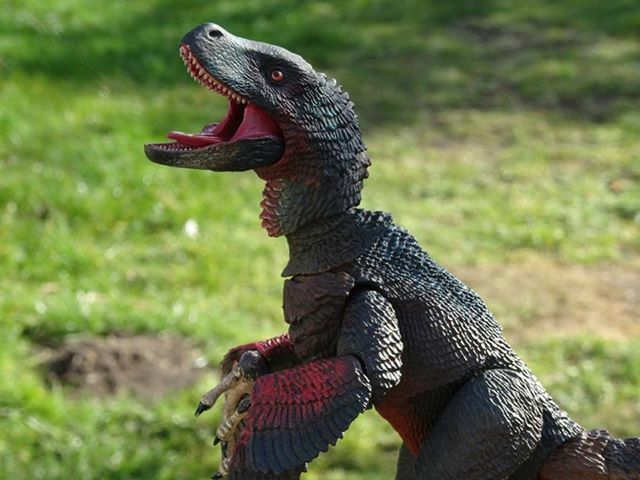 Our thanks to dinosaur model fan and collector Caroline who sent us some beautiful photographs of her recently purchased Beasts of the Mesozoic Atrociraptor marshalli figure. The taxonomic position of Atrociraptor within the Dromaeosauridae remains contentious, however, with a short, powerful jaw and oversized teeth this predator lives up to its scientific name meaning, that of “cruel or savage thief”. The Beasts of the Mesozoic Atrociraptor marshalli dinosaur model. A beautifully composed photograph. The outdoor location really brings out the colouration of the model, the exquisite way in which the bright red elements of the plumage have been blended in with the muted tones of brown and black. The sun lit model highlights the texture and the individual feathers on the torso and the top of hips can be clearly seen in this well-composed photograph. Named and described in 2004, some eighty years after the far better known Velociraptor (V. mongoliensis) was described, this dinosaur is estimated to have reached a length of approximately two metres and weighed around fifteen kilogrammes. The fossil material associated with this genus comes from the famous Horseshoe Canyon Formation of southern Alberta, however, a single jaw fragment and some isolated teeth from the Two Medicine Formation of Montana may also represent Atrociraptor. A scale drawing of the dromaeosaurid Atrociraptor marshalli. We are happy to post up Caroline’s excellent photographs, pictures of a fast running dinosaur, that was delivered quite fast as well. A close-up view of the distinctive short snout and the oversized teeth of the beautifully crafted Beasts of the Mesozoic Atrociraptor marshalli figure. The photograph (above), shows a close-up view of the head of the Beasts of the Mesozoic model. The characteristic short, robust snout and the oversized teeth that helped to define this genus can clearly be seen in this beautifully composed picture. Nemicolopterus or a Juvenile Sinopterus? As it is March 1st, team members at Everything Dinosaur, thought it appropriate that on St David’s Day, the patron saint of Wales, it might be a good idea to post up a picture of one of the welsh dinosaurs such as Pantydraco (P. caducus) or the recently described Dracoraptor (D. hanigani), but in the end we decided to post up a picture of a very tiny pterosaur instead. As we prepare for the arrival of the new for 2019 PNSO models, we have been busy researching and writing fact sheets to accompany sales of these figures. One of these new PNSO models is a replica of Nemicolopterus, which if it is a valid genus, represents the smallest member of the Pterosauria described to date. A scale drawing of the tiny pterosaur named Nemicolopterus. With a wingspan not much bigger than a garden robin (Erithacus rubecula), Nemicolopterus probably weighed less than 100 grams. Assigned to the Tapejaridae family, this little flying reptile, known from a single fossil specimen, has attracted quite a lot of controversy since it was named and described in 2008. To read Everything Dinosaur’s 2008 article about the discovery of Nemicolopterus: New Species of Tiny Pterosaur from China. The unfused bones and body proportions are very typical of a juvenile pterosaur. It has been suggested that the fossil specimen might not represent a tiny species, but the juvenile stage of a much larger pterosaur. For example, a number of academics have compared the Nemicolopterus fossil to juvenile specimens of the tapejarid Sinopterus, which is also known from China. The PNSO Nemicolopterus pterosaur model. The PNSO Nemicolopterus (or whatever genus the figure should represent), is coming into stock at Everything Dinosaur in the next few weeks. It has been suggested that Nemicolopterus may not be a valid genus. It has been proposed that the fossil material should be re-assigned to the genus Sinopterus. Whatever the outcome, on March 1st, in honour of a Welsh national symbol and with a nod towards the orient and the legends of dragons from the Far East, we thought it appropriate to post up some images of a tiny flying reptile. Tyrannosaurus rex may have been formally named and described more than 100 years ago, but this iconic dinosaur has certainly not lost any of its appeal since Henry Fairfield Osborn’s scientific paper (1905). The “tyrant lizard king” remains as popular as ever with casts of skeletons adorning many natural history museums and no dinosaur movie seems complete without an appearance or two of a T. rex. 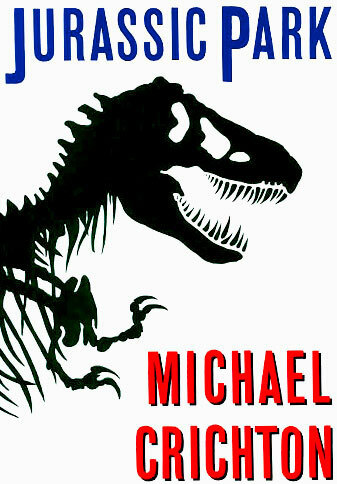 The first edition of Jurassic Park, featured on the front cover a silhouette of a T. rex skeleton, albeit with a few anatomical discrepancies. For dinosaur fans and prehistoric animal model collectors, there are a plethora of T. rex figures to collect and most manufacturers carry at least one replica of this, perhaps the most famous of all the dinosaurs, within their ranges. Today, we take a look at just one recently introduced figure, that of the 2019 Wild Safari Prehistoric World T. rex made by Safari Ltd. The Wild Safari Prehistoric World T. rex dinosaur model. A lot of print space has been devoted to trying to explain this carnivores’ enduring popularity. In the 2019 Safari Ltd catalogue there are no less than five Tyrannosaurus rex models within the Wild Safari Prehistoric World range and that does not include the baby dinosaurs in eggs. The most recent figure was introduced a few weeks ago (see picture above), this has led to some speculation that a number of the older figures in this range will be withdrawn. Measuring around seventeen centimetres in length and with that powerful head standing some eleven centimetres off the ground, this is not the largest T. rex figure available, but as with all the models in the Safari Ltd portfolio, it is well painted and has lots of fine detail. The figure has already attracted a 5-star review on the Everything Dinosaur website. The new for 2019 Wild Safari Prehistoric World Tyrannosaurus rex figure. A closer look at the new for 2019 Tyrannosaurus rex figure. The Bullyland Pteranodon sternbergi model is in stock at Everything Dinosaur. Everything Dinosaur team members have been able to secure some additional models from a product line that was retired several years ago. Limited numbers are available and staff have been busy emailing customers on our priority reserve list, letting them know that this flying reptile figure is available and that one has been set aside for them. The Bullyland Pteranodon sternbergi model. 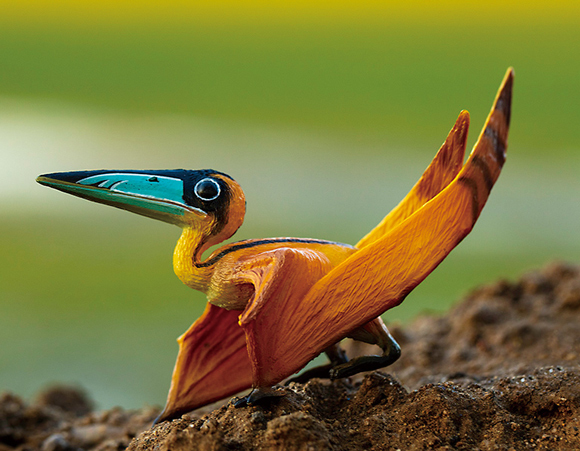 A lot has happened since this excellent pterosaur figure went out of production. The range of flying reptile figures has certainly increased but as far as we are aware, no mainstream manufacturer has introduced a P. sternbergi model. A lot has also happened when it comes to research into the Pterosauria and the Pteranodon genus. Although arguably, Pteranodon is perhaps the best known pterosaur, both with palaeontologists and the wider public, after all, there are in excess of 1,100 Pteranodon fossils in museums all over the world, there has been a dramatic revision of the fossil material ascribed to this genus. Visitors to museums seeing a beautifully modelled Pteranodon replica, often dangling from the ceiling, can get the wrong idea when it comes to the fossil material associated with this genus. The three-dimensional replicas do not portray the reality. The vast majority of fossil material comes from the Pierre Shale Formation and the Smoky Hill Chalk member of the Niobrara Formation, both marine deposits and Pteranodon fossils tend to be crushed, highly fragmentary, distorted and flattened like a pancake. A life-size Pteranodon replica is unloaded. Is this P. sternbergi or a representative of the genus Geosternbergia? Although the fossil record of assigned Pteranodon material is extensive, the fossils tend to be fragmentary and crushed. Geosternbergia sternbergi or Pteranodon sternbergi? The genus was erected back in 1876, when Othniel C. Marsh named Pteranodon longiceps. Over the years, several species have been added to this genus, one of which was Pteranodon sternbergi, named in 1966 from fossil material found in 1952. The species name honours the Sternberg family, who between them have made a tremendous contribution to North American palaeontology. Such a high profile pterosaur genus with a wealth of fossils to study, has led to academics focusing on this genus and large numbers of scientific papers about Pteranodon have been produced. Inevitably, numerous revisions have been suggested. For example, it has been proposed that the fossil material represents a total of four different flying reptiles (Kellner 2010) and this led to the idea that P. sternbergi, was so different from P. longiceps that it should be assigned a separate genus. Hence the use of the genus Geosternbergia (G. sternbergi) often regarded as a subgenus, in recent literature. The shape and size of the crest and subtle differences in the mandible has led to a revision of Pteranodon fossil material. In essence, over the period of time that the Bullyland Pteranodon sternbergi has been out of production, a revision of the fossil material has led to the placement of material formerly ascribed to P. sternbergi being assigned by some scientists to Geosternbergia. The debate over the taxonomy of the pterosaur that honours the Sternberg family (and other Pteranodontia material), is likely to continue, at least, for the time being collectors have the chance to acquire the model. Hot on the heels of several Schleich new for 2019 model reviews, JurassicCollectables have posted up a video of the new Eofauna Scientific Research Giganotosaurus dinosaur model. The narrator correctly surmises that this is the first dinosaur figure to be introduced by Eofauna and the Giganotosaurus is heralded as being one of the most scientific accurate dinosaur models to have been made. As Everything Dinosaur works closely with Eofauna Scientific Research, we were able to provide the JurassicCollectables team with exclusive images showing the three-dimensional skeletal reconstructions that the designers at Eofauna created in order to help ensure the accuracy of their figure. Osteological measurements were taken in order to build up the muscles and the skin texture. The wrinkles on the dinosaur model reflect how this Cretaceous hypercarnivore would have actually moved. A three-dimensional model of Giganotosaurus carolinii was produced to ensure a scientifically accurate dinosaur replica. In this short video (duration just under nine minutes), the narrator opens up the plastic bag containing the model and the proceeds to take the viewer on a guided tour of the figure. The close-up views of the articulated jaws and the inside of the mouth are particularly well done. Everything Dinosaur team members pointed out to JurassicCollectables that if the lower jaw is viewed from the side, the tip of the jaw is thicker and more robust. We have nicknamed this characteristic of Giganotosaurus anatomy the “boxer’s chin”. Not that this dinosaur indulged in pugilism, however, this thickened bone may have evolved to help protect the rest of the jaw from impact damage as this predator lunged and attacked its prey. The Eofauna Giganotosaurus dinosaur model. The anterior portion of the lower jaw is thickened, perhaps an adaptation to help protect the dentary from impacts. In the video review, JurassicCollectables note the care and attention taken over getting the scales on this dinosaur to look right. In the section of the video that focuses on the ribs, viewers will note the very fine scales with just the occasional, larger rounded scale on the model picked out, these scales are most prominent on this part of the figure. As the replica has been designed based on a 3-D simulation, Eofauna have been able to add lots of wrinkles and folds to depict movement, at the back of the femur (thigh area) for example, these are once again highly accurate based on the skeletal assessment. Such features are skilfully highlighted in this excellent video review. During the video review, the two other Eofauna figures, the Steppe Mammoth and the Straight-tusked Elephant are introduced and provide a size comparison with the Giganotosaurus. Naturally, off-colour Alan also gets involved. Comparing the Eofauna Giganotosaurus with the Eofauna Steppe Mammoth. The Eofauna Giganotosaurus compared with the Eofauna Straight-tusked elephant.